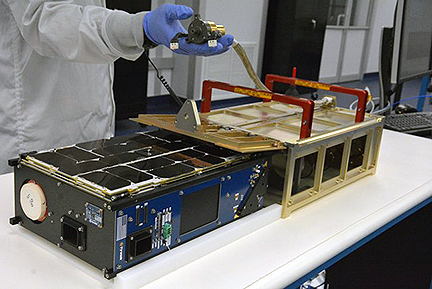 Tyvak's CICERO 6U smallsat for GeoOptics has been successfully deployed from Rocket Lab's Electron launch vehicle, 'It's Business Time' — the GPS radio occultation satellite, used to enhance weather monitoring, launched from Auckland, New Zealand and is now in LEO. The Cicero 6U smallsat and Deployer. Photo is courtesy of Tyvak. Based on Tyvak's Endeavor platform, CICERO has been further developed to increase its responsiveness and autonomous operations in a timely manner. As part of this demonstration, CICERO automatically reached a fully controlled state in less than 20 minutes. This is not the first time that Tyvak has accomplished this goal. Tyvak's GEOStare, a 3U smallsat mission launched earlier this year, was fully functional during its first pass and successfully completed an enhanced situational awareness demonstration shortly thereafter. Following a successful commissioning phase, CICERO obtained nominal payload data within the first 12 hours after launch. The data was then automatically downloaded by Tyvak, verified and processed by GeoOptics, and immediately made available to users. Marco Villa, Tyvak's COO, noted that this latest CICERO satellite has demonstrated an incredible responsiveness. The company hase worked hard to perfect the process of what the firm likes to call Agile Space. With this term, Tyvak's ability to provide reliable, economical and timely solutions is described, with a greater focus on customers.